Minnesota Vikings wide receiver Cordarrelle Patterson reacts as he walks off the field after the Vikings' 14-13 win over the Lions. 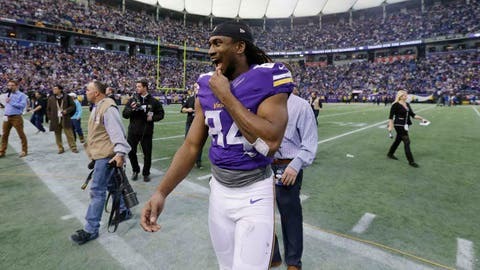 MINNEAPOLIS — A handful of Cordarrelle Patterson’s family members from Rock Hill, S.C., were among the droves of fans who witnessed the final Vikings game in the Metrodome. After walking through subzero temperatures to reach the demolition-destined venue Sunday, they joked with him they may not be coming back. "It’s kind of cold up here in Minnesota," the 22-year-old rookie said with a youthful grin. Other than playing outdoors at the University of Minnesota’s TCF Bank Stadium the next two years while the Dome’s replacement is erected, the future looks pretty bright for the kid they call Flash. Especially after the final game of his first NFL campaign. Patterson scored both touchdowns in the Vikings’ 14-13 victory over Detroit, a matchup of playoff-eliminated NFC North foes. Cementing his name near the top of the NFL’s all-time rookie production charts, he accounted for a combined 136 yards receiving, rushing and returning kickoffs — the Lions were bold enough to kick toward the league’s leading return man three times. He carried the first one 20 yards early in the third quarter and set a new team record for the most kickoff return yards in a season. His average of 32.4 yards per runback are also tops in franchise history. But Patterson was even more instrumental offensively in helping Minnesota lay the Dome to rest with a home win. Matt Cassel found him from 8 yards out to put the Vikings ahead for good with 9 minutes, 19 seconds left in the contest. Patterson used his sinewy, 6-foot-2 frame to separate from cornerback Chris Greenwood in the left side of the end zone for his ninth touchdown of the year — the fourth-most by any Vikings rookie all-time. The eighth came in the first quarter on a broken play. Lined up at running back — which he’s done regularly down the stretch with injuries depleting the Vikings backfield — Patterson took a toss left from Cassel, then cut back to his right and looked downfield for an open receiver. Instead of throwing, he blew past Ndamukong Suh near the line of scrimmage then traversed nearly the entire width of Mall of America Field on a 50-yard jaunt to paydirt. It was a showcase displaying the all-around effectiveness of the Tennessee product’s skill set — speed, acceleration, strength, shiftiness and an uncanny eye for open space in front of him. "There’s no one time that I’ve seen all year that the first player that comes in contact with him makes the tackle," said Cassel, who completed 20 of 33 passes for 189 yards. "Obviously, he’s got all the physical attributes that you look for in outstanding players." Said Patterson: "I just want the ball in my hands." The Vikings picked Patterson in the first round of the 2013 NFL Draft to supplant the loss of fellow jack-of-all-trades Percy Harvin. The results include leading the league in net yardage (2,020 yards, fifth-most in team history) and becoming the only NFL wideout since the 1970 merger to score three rushing touchdowns in a season. His versatility lends to placing him in the backfield (first touchdown Sunday), out wide (second touchdown) or in the slot. And to think Patterson only played one year of major college football. "I think he’s going to be pretty special," said Vikings coach Leslie Frazier, who is reportedly on his way out the door after his team’s 5-10-1 finish. "He can be one of the all-time greats before it’s over." Seeing limited time early on in the year — one of several decisions for which Frazier has drawn heavy criticism — Patterson slowly worked his way into an everyday receiver’s role. His prowess as a returner was evident from the outset, though, and he finishes the regular season as the NFL’s top return man. That’s even with teams frequently squib kicking in order to avoid him. And his club giving up a near record-low amount of points this season, creating more kickoffs and opportunities for his average to dip. Only Chicago’s Devin Hester ran back more kickoffs than Patterson (43) this season. Rather than sulk early about his lack of playing time or his employer’s many struggles, Patterson did his best to enjoy the heck out of his first year on the job. "I’m a guy, I like to have fun," said Patterson, who also had an NFL-record 109-yard kickoff return earlier this year against Green Bay. "I’m always happy. You will probably never see me down, unless something bad happens." Never was his demeanor more evident than after his touchdown run Sunday, when he ran off the field shaking his dreadlock-covered head fervently and laughing. But Patterson is still a rookie, and rookies sometimes can have too much fun. He never even saw the opening kickoff, which sailed to his right and was fielded in the end zone by tight end Chase Ford. Patterson was waving his arms to pump up the crowd in the end zone behind him. But there weren’t too many green-man miscues this season from a guy whom some in the Twin Cities are touting for rookie of the year. Patterson certainly would have Vikings defensive end Brian Robison’s vote. "I think his tape speaks for itself," Robison said. "I mean, rookie year and doing the things he’s doing . . . I think the sky is the limit for him. I really do." No arguments from reigning NFL MVP Peterson: "Man, he’s grown on me strong. He’s an incredible athlete. "This kid right here, he’s real good. He’s the real deal."